The hatred and anger toward the Jews didn’t stop there. In his next sermon on July 21, he continued: “Judgement day will not come until the Muslims fight the Jews.” Throughout his speech, he prayed for Allah to “count them [the Jews] one by one and annihilate them down to the very last one, do not spare any of them … Let us play a part in this. Oh Allah, let us show in words and in deeds.” There are no clearer words to imply the death of Jews than the words Imam Shahin proclaimed on this day. As a Jewish student, I have seen my fair share of anti-Semitic actions on campus. I’ve had foul and intolerable words yelled at me while I’m studying because I had a sticker of Israel on my laptop. When Arab-Israeli Diplomat George Deek came to speak on campus, anti-Semitic students shouted, “Death to Jews” at my friends and me. I’ve known Jewish students who are afraid to speak up in class against anti-Semitic professors because they’re afraid of what might happen to their academic reputations. I’ve seen the clear and blatant anti-Zionist newspaper clippings that were in Hart Hall for at least two years, even after multiple complaints by Davis Faculty for Israel and Aggies for Israel. What I haven’t seen is an open statement from the school about any of these events, let alone the events that happened on July 14 and July 21. I’ve yet to receive an email from the Chancellor showing his deepest sorrows regarding the Imam’s sermon. This lack of concern and condemnation against hate speech from the university makes us students feel as if the community and school do not recognize our issues and the struggles that we as Jewish students face on campus. But what’s more frustrating is that, due to the lack of exposure and punishment for these acts, other students don’t know what happened. 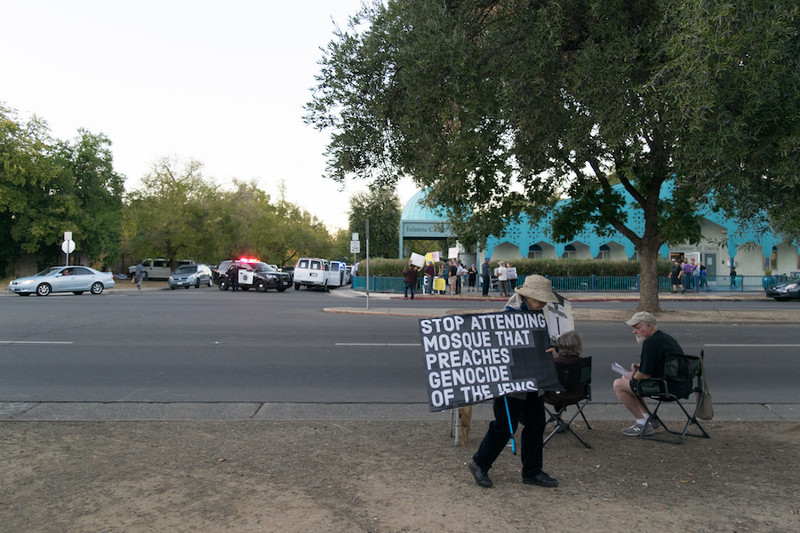 They’re blind, not only to the harassment of Jews and Israelis during my tenure at Davis, but also to the Imam’s sermon. When the Islamic Center was vandalized, Jewish organizations wrote letters to the Center expressing their deepest sorrows and condemning any acts of violence. In another effort to show their condolences and solidarity, Sigma Alpha Epsilon Pi, a Jewish interest sorority, delivered cookies and pastries to Epsilon Alpha Sigma, the Arab sorority on campus. Interim Chancellor Hexter sent an eloquent message to the community stating, “We want to express the disgust, outrage, and sadness we feel over this incident. We know that it has caused, and continues to cause, great distress and fear among members of the Muslim communities at UC Davis and in the City of Davis. We extend to both our deep sympathy and unwavering support.” This was just a brief portion of the email that was sent to all Davis students. None of these actions were reciprocated to our community when words of hatred were thrown at us. Despite the silence by the administration, those of us who deem it necessary to expose the hate that has been expressed against Jews on our campus have shared these traumatic experiences with others. Many students have wondered, upon hearing Imam Shahin’s statements, why they are only just now hearing about them, and were angered by the school administration’s silence. Hate should not be accepted by any person or any community. Now, more than ever, we have to stand with one another, regardless if they’re Jewish, Muslim, pro-Israel, pro-Palestine, gay, transgender, black, Hispanic or white. A person is a human, and that should mean something.